Pathology requisitions, important anatomic and clinical pathology documentation, and billing forms are available to download. Click on the buttons below to open a fillable-PDF. Once opened, right click on the file to print or save a copy of the PDF to your computer. If you need assistance, please contact Client Services. 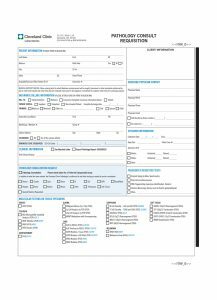 Before submitting a requisition to Cleveland Clinic Laboratories, please ensure that the Client Information section in the top right corner of the form is completely filled out.